Put this dough in the form and press it firmly to make the bottom layer. Mix tofu with sugar and vanilla sugar. Fold in the yoghurt. Stir in the lemon juice. 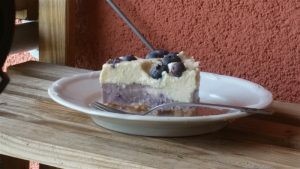 Divide the cream and mix the pureed blueberries in one half of the cream. Fold the whipping cream into both halves. 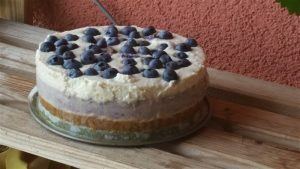 Spread the blueberry-cream onto the bottom of the cake. After this spread the light cream onto the blueberry cream. Refrigerate at least for 5 hours.